Gang Green Nation sat down with Connie Carberg to talk about scouting. Many of you may not know that the first female scout in the history of the National Football League worked for the New York Jets. Her name is Connie Carberg. Connie grew up with the Jets, as her father, Calvin Nicholas, was the team’s internist, and her uncle, James Nicholas, was the team’s orthopedist in the era of Joe Namath and the early history of the team. 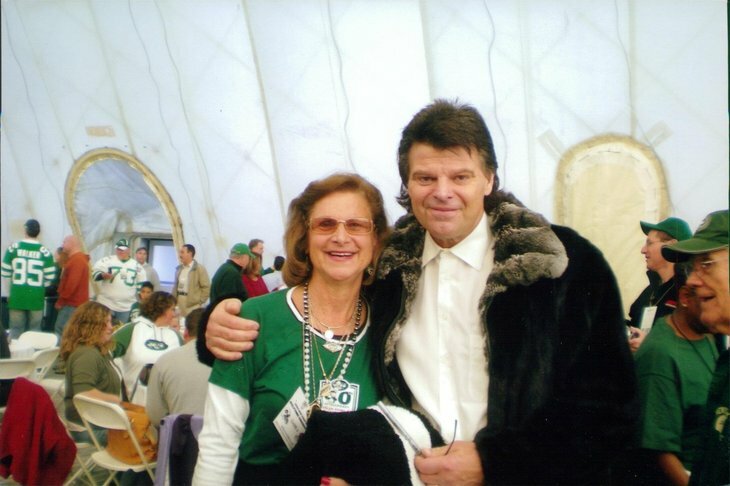 When Connie graduated from The Ohio State University in 1974, she began working for the Jets as a secretary, and eventually began scouting players. She soon became a traveling scout for the team, eventually personally selecting TE Mike Bartoszek from Ohio State in the 17th round of the draft in 1975. In 1979, she “discovered” Mark Gastineau, recommending that the team draft him as well. When you are looking at a player, what characteristics do you look for? How do you prioritize those characteristics? Is that generally up to the individual scout, or does the team tell the scouts specifically what they want? When I worked for the Jets in the 70’s it was probably very different than now. We were watching game films reel to reel, using typewriters with white-out and no computers. Reports on potential draft picks were all hand written and there were no cell phones to contact players. The Jets had their own scouts and were also sharing reports with a group of other teams (National Scouting). The forms had strong points, weak points, overall grade for each player and then sub categories about each separate position. There was a basic system in place for what grade, round or undrafted. Then when it was time to make the big board, best players regardless of position, then also other boards ranking best players by their position. Every NFL club emphasizes different things. Dallas was first to go with computer and by numbers, – Ht., Wt, speed, vertical etc. Other teams valued the Wonderlic and character players, others character wasn’t on top of list. Guys ran on grass or AstroTurf and always faster on AstroTurf so that was important to know. When you interviewed players before the draft, what kinds of questions did you ask? Were they generally basic things like, “Have you ever had a concussion before,” or more complex ones? Did you have any tricks to getting them to reveal a little more information? When we started to bring top players in later for physicals and “interviews” things got more complicated. The injuries a player had or knee or shoulder problem likelihood in future could affect draft status. Also the questions were just to see type of person and how fit in with team. I just had regular conversations, as did other scouts. Remember there was no free agency, drug testing or agents by their sides. A very different world so very easy to have normal conversations. One of our writers wanted to know if you would you have drafted Mark Sanchez fifth overall, knowing what the New York Jets knew at the time? Drafting Mark Sanchez as the 5th I would have done that year. Matt Stafford was gone and the only other QB available was Josh Freeman and the jury is still out on him. Mark only had the one starting year at USC but it was a pro offense and he was a good athlete with above average arm. He was so thrilled to be a Jet and full of enthusiasm and I saw lots of good things that first year. New York is a tough place to be a QB and when he got down or uptight, he seemed to think too much, instead of using his athletic ability. His play action ability was superb but if the other team doesn’t respect the run, what good is it. You’ve been credited as the person that “discovered” Mark Gastineau. Do you remember what stood out in particular for you when you were scouting him? When a replacement was needed at the Sr. bowl in 1979 for Mike Stensrud, I did work and suggested they take Mark Gastineau. He was at a small school, East Central Oklahoma, but his size at 275 and speed (4.5-4.6) at DE and non-stop motor stood out. Then when I called him (also called others to see if wanted to play) his readiness and enthusiasm cemented the deal. Then he went on to be Defensive MVP of Sr bowl and 2nd round pick instead of 5-6th as projected. If you would like more information on Connie, check out her website, or message her on Twitter at @ConnieScouts.